Much of the work we do together as a Session and really as a church is accomplished in meetings of various kinds. There's an old joke that if anything needs to be done in the Presbyterian Church, you have to form a committee to do it! Everyone has been to a meeting that just doesn't seem to work so well. Folks interrupt each other or are even rude to one another, they speak about all sorts of things at once, there doesn't seem to be any focus or anything accomplished - everything is chaos! A good, well-run, orderly meeting, however, can be very productive and uplifting (and even brief!) This lesson is intended to be an introduction to (or review of, for those who are old pros at meetings!) parliamentary procedure as it relates to the work of the church, especially the work we do in meetings. There is even information and tips on how to run (or moderate) a Ministry Meeting, something that FHPC may ask its Ruling Elders to do. The Book of Order designates Roberts Rules of Order, Newly Revised, latest edition, as the parliamentary authority in the meetings of church councils (which includes Session). 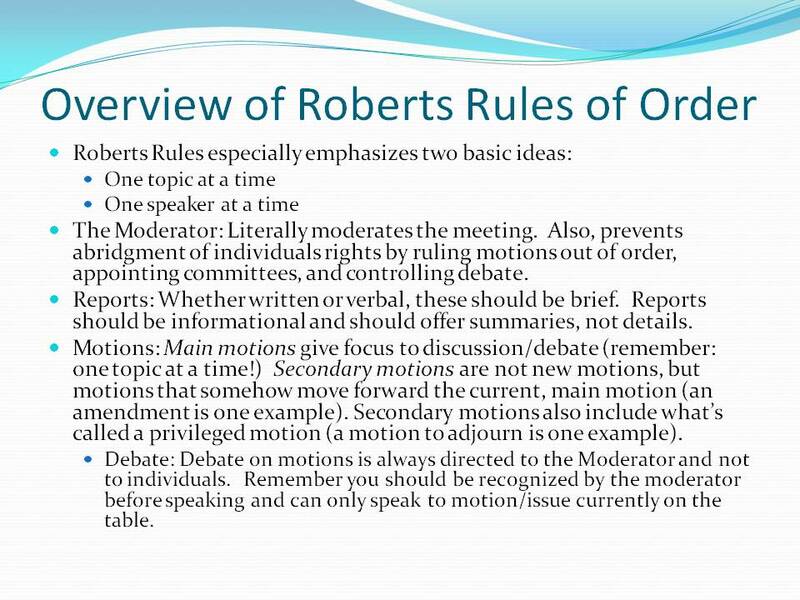 Roberts Rules of Order is the most commonly used parliamentary authority in the world. While it does not replace Scripture or the Constitution of the PCUSA, it provides guidance to us in addressing situations the Book of Order may not address directly. It is how we provide for "decency and order" in our meetings. It is critical that we follow this orderly process for making motions - whether in meetings of Session, the congregation, Ministry meetings, or even smaller committee or task force meetings. This simple process ensures that everyone - whether they end up in the majority or minority - has an opportunity to share their feelings on specific issues in an orderly way and that everyone knows exactly what is being discussed and voted on. 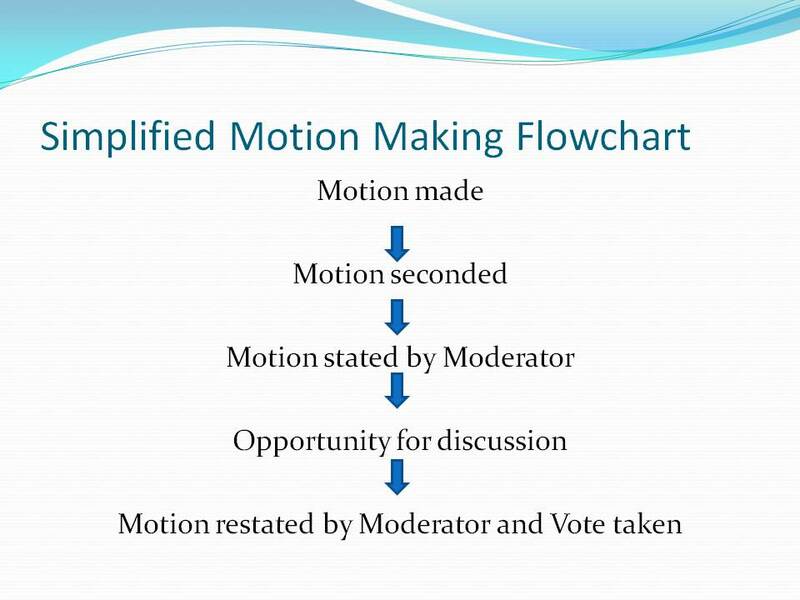 An overly simplified version of motion making is below and will be very helpful for you to know and follow whenever you might moderate meetings! An excellent resource for learning more about Parliamentary Procedure as it relates to the church is Parliamentary Procedures in the Presbyterian Church (USA). It is free online and brief, and it can serve as an especially helpful resource to anyone new to these ideas, or to anyone serving a higher council of the church, such as Presbytery or General Assembly. 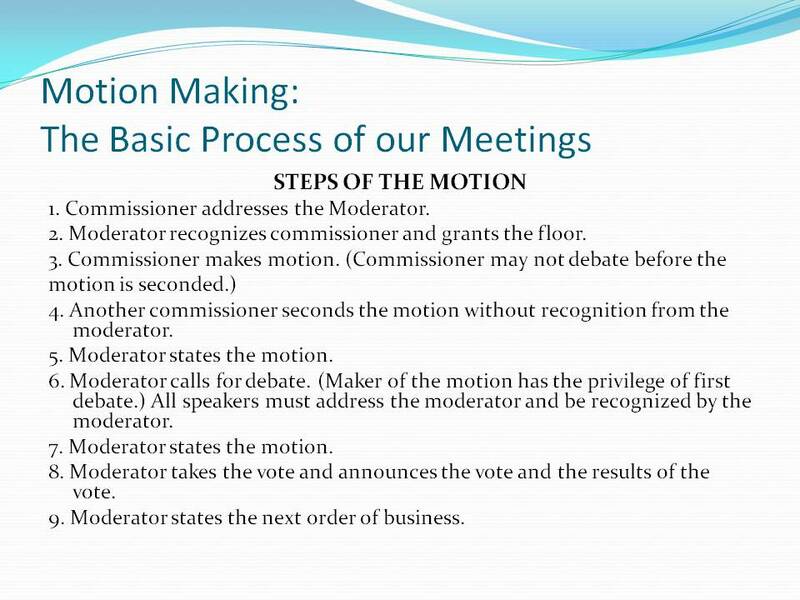 What questions do you have about meetings, parliamentary procedure, or Roberts Rules of Order? How does proper order impact our ministry? Spend time in prayer, asking God to guide us in hearing the voice of the Holy Spirit through the voice of others as we meet and discern God's will together. Pray for God's will to be done in and through us.